SEATTLE – In what will be a major upgrade for international passengers, the final structural roof beam was raised by a crane and safely put in place today marking the latest construction milestone of the new International Arrivals Facility at Seattle-Tacoma International Airport. The ‘topping off’ of the main IAF structure highlights the project is rapidly progressing towards its scheduled opening in the fall of 2020 when the new 450,000 square-foot grand hall will be five times larger than the current 1970’s-era facility. 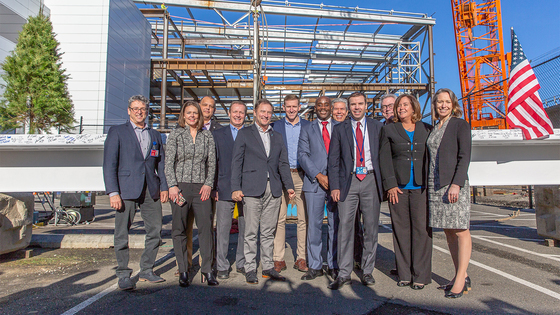 Commissioners and Executives from the Port of Seattle and Airline and other industry partner Executives and Officials attend the Topping Off Ceremony of the International Arrivals Facility. 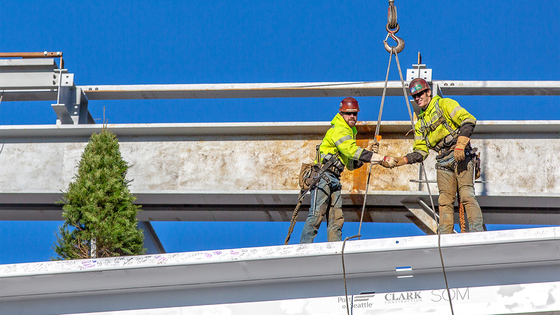 Tradesmen shake hands after guiding the final beam into place on the International Arrivals Facility at Sea-Tac Airport today. Operated by the Port of Seattle, Seattle-Tacoma International Airport (SEA, KSEA) is ranked as the 9th busiest U.S. airport, serving nearly 46.9 million passengers and more than 425,800 metric tons of air cargo in 2017. With a regional economic impact of more than $22.5 billion in business revenue, Sea-Tac generates 151,400 jobs (87,300 direct jobs) representing over $3.6 billion in direct earnings and more than $442 million in state and local taxes. Thirty-four airlines serve 91 non-stop domestic and 28 international destinations including Canada, Mexico and seasonal operations.